This is a copy of a photo showing families boarding a freight train car in preparation to leave Russia in the 1920s. 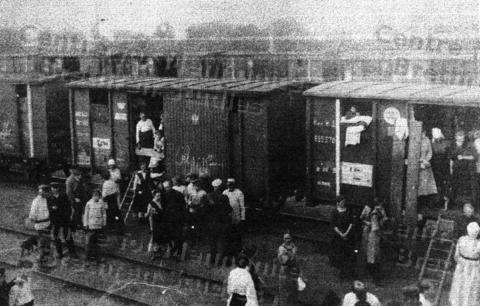 About four families lived in one of these small freight cars for about two weeks en route to Riga, providing their own food along the way. Photograph in Gerhard Lohrenz, HERITAGE REMEMBERED: A Pictorial Survey of Mennonites in Prussia and Russia, revised and enlarged (Canadian Mennonite Bible College, 1977), 264.